Pencils Books and Dirty Looks: Word Jar... My newest product!! Word Jar... My newest product!! It's been quite some time since I've had a chance to make a new product. I have so many things on my to do list but can only find a few minutes here and there to work on them! You all know that I love using "Workstation Jars" in my classroom. They are portable, easy to store and just plain fun!! My latest creation is a Word Jar with Frye's 1,000 high frequency words. There are soooo many activities that you can do with this jar. Students can work on fluency, play buddy games, put words in alphabetical order, practice spelling, and so on. 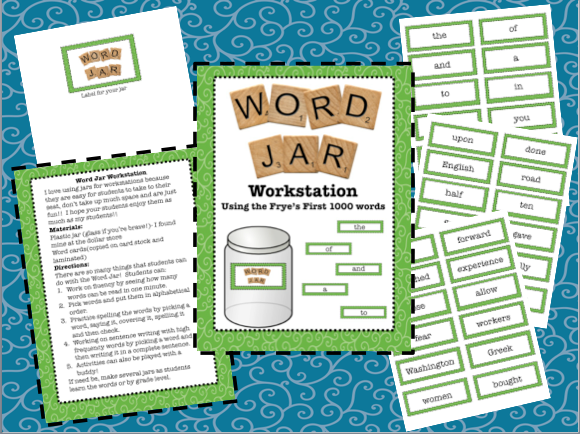 Here is a preview of my Word Jar Workstation. Feel free to check it out in my TpT or TN store.